PES Real Madrid Team Guide. Real Madrid uses a 4-3-1-2 formation. I find that the default formation does not bring out the best in KAKA. He is in the AMF role, and he is often in a congested area whenever he gets the ball. Thus I tweaked a little of the default formation to 4 – 4 – 2 to play Kaka in the LMF position. Kaka and Ronaldo have space to dribble and wreak havoc. With a short run up, Ronaldo‘s shot will be low, powerful, and homing for the corner of goal. Xabi Alonso is a great passer of the ball, and a great long range shooter as well. M. Diarra is strong to win tackles and headers. Van Nistelrooy is a brillant sharpshooter and header of the ball, while Raul has great shooting technique. Both of this two veterans are very responsive to loose balls in the box, so keep them high up the pitch. Benzema is a good all rounder striker with pace and great shooting techniques. The Real Madrid second team is talented and can be counted on. Van der Vaart can replace Alonso. Guti can be brought on for Raul, and Benzema may be substituted with Higuain, who has great potential to be a superstar in the game. Lastly, buy a new reserve goal-keeper. Try not to use Dudek as he makes ridiculous blunders in the game. In my first season, the captaincy is between Raul and Guti. As this two older players age and their abilities fall, I had made Xabi Alonso my captain since he starts most of the games. Real Madrid has attacking sidebacks, and is prone to fast counter attacks. They has a weak left defence when they play Drenthe and Marcelo. Thus if you are facing Real Madrid, attack their left defence! Remember to man-mark Ronaldo. And if their goal-keeper is Dudek, keep trying long shots! The strongest point of R. Madrid is the right wing. C. Ronaldo should be placed as the right wing’s most advanced possible, note that in his notes is the highest in the attack from the side. Metzelder blocking attacks by left entirely defensive. Gutti supporting C. Ronaldo and S. Ramos. Xabi Alonso is the Surprise. Rogerio, good suggestion, but it seems as if your team lacks a little bit of balance, it is very offense minded, i know Madrid play in a similar mannner but i feel that you would concede too many unnecessary goal. with a 4-3-3 formation you could try as a suggestion. Lassana Diarra/ Mohammadou Diarra (DM), prefer the latter coz of the better defence rating. Your front three seem spot on, putting ronaldo as a support (SS) might help a bit more as he will tend to be closer to the (CF), which helps with link-up play. 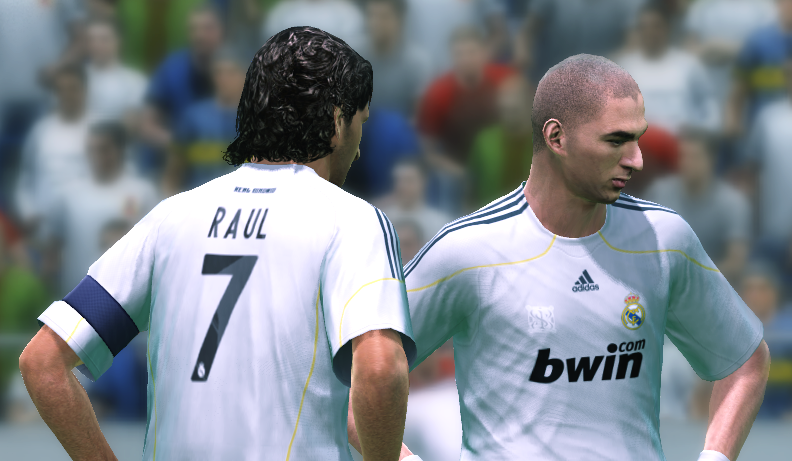 Neo, can you please update this page for PES 2011 as Real Madrid is different! Real Madrid lost the strength of Ronaldo, as he is no longer able to run faster than all the defenders!! Any tips to beat Barca? Best formation of real madrid.